As CFO, Mendez will advance UTSA’s vision of enrollment growth, new capital projects. (Oct. 17, 2018) -- Following a national search, UTSA President Taylor Eighmy today announced the selection of Veronica Mendez, vice chancellor and chief financial officer at the University of California, Merced, as UTSA’s next Vice President for Business Affairs. Mendez joins UTSA with 16 years of experience in higher education, where she has provided leadership in finance, human resources, institutional research, and strategic and business intelligence initiatives. In her current role at UC Merced, the University of California System’s youngest university, Mendez has made significant contributions to the success and momentum of the Merced 2020 Project, a four-year, $1.3 billion initiative that is adding 1.2 million gross square feet to the university’s campus footprint by leading the development of the project’s comprehensive financial plan and its organizational structure. As UTSA Vice President for Business Affairs, Mendez will provide oversight and stewardship of the university’s financial resources while working closely as a member of the UTSA Senior Leadership Team to advance UTSA vision to become a student success exemplar and nationally competitive research university. Her initial priorities will include oversight of UTSA’s transition to a new budget model, which will help the university create a strong foundation for fiscal health while laying the groundwork for growth and innovation. The new model began as a year-long pilot on Sept. 1, 2018 and will be fully implemented in fiscal year 2019-2020. 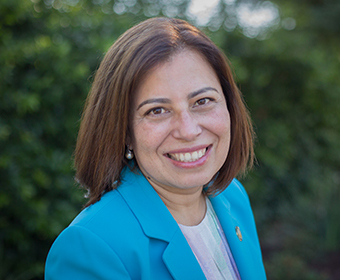 As the university’s chief financial and administrative officer, Mendez will provide leadership in advancing other ongoing initiative, including the Campus Master Plan and the expansion of the Downtown Campus. Additionally, she will oversee business affairs administration, budget and financial planning, business contracts, business information services, facilities, financial affairs, human resources, public safety and purchasing. Mendez began her academic career at the University of Texas Rio Grande Valley (then, the University of Texas at Brownsville), where she was a student before spending 12 years in senior leadership roles focused on finance, budget development, facilities, capital planning and project management. There, she managed a $3.9 million operational budget. Mendez earned her bachelor’s degree in applied arts and sciences – management and her master’s of business administration at UT-Brownsville. Throughout her career, she has participated on several boards and has served as president of the Texas College and University Facilities Association. She was recognized as one of Texas’s Outstanding Women in Government in 2010. UTSA launched a national search for the next Vice President for Business Affairs in July with the appointment of a broadly representative search committee chaired by Provost and Vice President for Academic Affairs Kimberly Andrews Espy. The committee, comprised of faculty, staff and students, made a concerted effort to obtain a diverse, well qualified candidate pool. Mendez begins her new role at UTSA on January 6, 2019, succeeding UTSA Vice President for Business Affairs Kathy Funk-Baxter who announced her retirement earlier this year. Learn more about the UTSA Vice President for Business Affairs.